Many struggling parents work multiple jobs to make ends meet. The need to work such long hours creates unhealthy situations for children who arrive to an empty home after school. They make poor nutritional choices, fall behind on school work and enter into unhealthy friendships and relationships. The Salvation Army offers children a safe place to go after school where children attend structured activities and have supervision from caring adults. We've learned first hand that children involved in after-school programs are far less likely to succumb to risky behaviors. Many youth we work with do not have the opportunity to play a musical instrument, have access to a computer outside of school hours, enjoy arts and crafts, or play competitive games in a protected setting. Our after-school programs change kids' lives by helping them achieve academic success through homework help and tutoring. Our programs also place a special emphasis on activities that encourage character and life skills development. Some locations bring in professionals to speak to the children about different struggles that kids are facing, like body image and bullying. Through mentoring and education, children and teens are shown the possibility of a better life. The Salvation Army gives all youth a chance to experience educational enrichment, life skills development, and spiritual and physical wellness. Many Salvation Army Centers for Worship & Service offer a wide variety of lessons and group rehearsals in both music and the creative arts. Often there are brass, voice, piano, dance and drama lessons being offered free of cost to young and old alike. It is our desire to see children reach their full potential through the vehicle of music and arts. Every year, the Empire State Division offers over 190 young people the opportunity to go to a Music and Arts Camp and experience the gift of music and arts through rehearsals, lessons and fun at our own Long Point Camp on Seneca Lake. This camp is just one of the ways in which young people from across the state have the opportunity to find their creative spirits and passion for learning through the gift of music and putting what is learned into other facets of their lives. It is a privilege to share this gift with the community. The Salvation Army provides many youth from low-income families with a summertime opportunity to attend summer day camps. This program integrates educational enrichment, computer usage, arts and crafts, recreation and field trips to enhance and motivate children's imaginations. Salvation Army summer day camps are set in a safe, clean and comfortable facility with well-trained counselors, music instructors, and certified athletic trainers. Day camp is a way for youth to be in a positive environment that reinforces good behaviors. 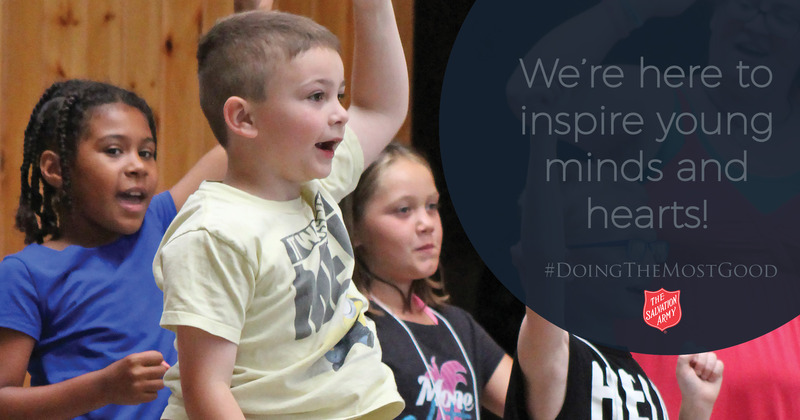 Your child will play, laugh, discover, compete, share, build, swim and grow.The Salvation Army also offers an affordable week long overnight summer camping experience. Lisa was a young girl who was well on her way to developing an eating disorder. She was only 6 years old, but already struggling with intense body image problems. Being involved in The Salvation Army after-school program gave Lisa access to caring adults that spoke into her life about these issues and helped Lisa to develop a positive body image. Jordan was a young man being bullied at school and, in-turn, bullying others. He began attending a Salvation Army after-school program this year. After only a short time, his grades went up and his parents say his behavior has improved both at school and at home. He does not bully other kids anymore and has gained the skills to appropriately handle being approached by bullies.